Idaho Chicken Ranch: New Orleans Nightlife! Ah, nightlife. Ten years ago we went on a "haunted tour" -- with a giant strawberry daiquiri to go. It was fun to wander around on the tour with a giant Slurpee-sized cocktail. 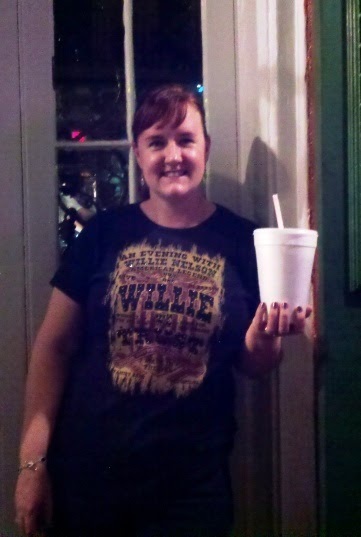 This time we went on the "voodoo" tour, so I went with a giant pina colada...rum and coconut being more... voodooey. I only made it through about 6 ounces of this sugary concoction, but it was fun. It's really old. And crusty. And fun. Really crusty. That's the pirate Jean Lafitte on the back wall. Behind that, that's the original flat screen TV from the 1720s. I told my husband this picture was blurry. 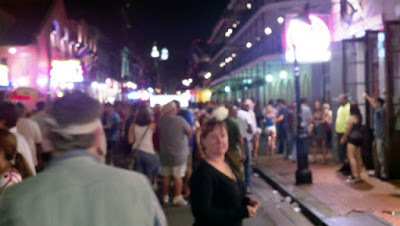 He said "That's what Bourbon Street is like." Good point.